100-B Type Constant Spring Supports Designed with Double Transverse Lugs for a Refinery in Mexico | Piping Technology & Products, Inc. 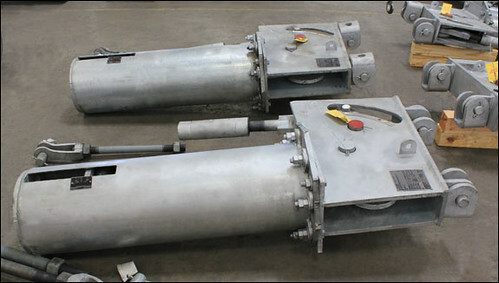 These 100-B Type vertical constant spring supports were designed with double transverse lugs for a refinery in Mexico. The constants were fabricated from A-36 carbon steel and they range in size from 23-1/4″ to 26-5/8″ in height, 50″ to 78″ in length and 18-3/8″ to 18-3/4″ in width. They are designed for operating loads ranging from 8,000 – 27,000 lb. and upward movements ranging from 3″ to 7″. The double transverse lugs allow the entire constant to swivel with the rod. Standard load and travel tests were performed prior to shipment.